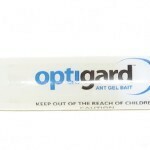 PRODUCT DESCRIPTION: Optigard Ant Gel Bait offers unparalleled control of a broad spectrum of ants, including Argentine, carpenter, ghost and other nuisance ant species, by ingestion and transfer of the bait, providing efficacy against the entire colony, not just the workers. Optigard Ant Gel Bait doesn't have the unsightly yellowish-brown color or the inconsistent, runny consistency of other baits. It's transparent at application and stays clear throughout treatment. It has little to no odor and doesn't stain treated surfaces. And its thicker consistency allows it to hold its shape without running. WHERE TO USE IT: Both inside and outside the home. Bait Application This product can be applied using the syringe applicator or a bait injector. Apply bait in cracks, crevices, corners and out of the way places, such as under and behind kitchen appliances and baseboards, under sinks, around window and door frames, pipes and water heater and in the attic, crawl space and garage. RATE OF APPLICATION: Use enough bait to provide foraging ants all they can take. If they consume all bait, reapply. Bait can stay attractive for two weeks. Reapply as needed. Love this product! I like the fact that it is clear and doesn't leave residue.